The AAOP is proud to announce that the sixth edition of the AAOP Guidelines edited by Reny de Leeuw, DDS, PhD, MPH & Gary Klasser, DMD and with contributions from several other AAOP members, has been published and is available for $56 at Quintessence Publishing. 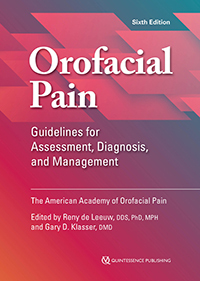 This state of the art book is a must for everyone interested in assessment, diagnosis and management of orofacial pain and associated conditions. All AAOP Fellow and Active Members have been given or will be sent a complimentary copy.